Our flagship spy software product, SpyAgent, can be purchased in an optimized Stealth Edition. SpyAgent Stealth Edition features a preconfigured installer that installs the software in optimal stealth - with no user interaction needed during the installation process. The actual SpyAgent software is no different than the normal SpyAgent version - only the installation method is different - which takes all the effort away from the user in hiding the software. Spytech SpyAgent provides a large array of essential computer monitoring features, as well as website and application content filtering, chat client blocking, lockdown scheduling, and remote delivery of logs via email or FTP. 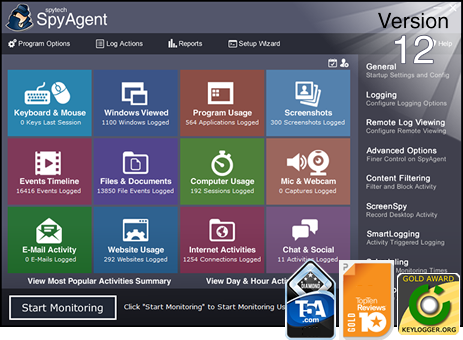 SpyAgent's innovative and easy to use feature-set is unmatched, and provides the ultimate all-in-one computer monitoring software package. SpyAgent Stealth Edition contains all the same monitoring and security features that the normal edition of SpyAgent contains - only the installation method is different - as outlined below. SpyAgent is installed in optimal stealth, with no extra configuration needed from the user. The installation is preconfigured for OPTIMAL STEALTH so that there is virtually no chance that a monitored user will be able to detect and remove the SpyAgent software. You can realistically have SpyAgent installed, and monitoring as fast as your PC can download the software. The actual installation takes mere seconds to complete and start monitoring! No user interaction is needed during the Stealth Edition installation process. Only a single installation confirmation prompt is displayed when the install is started. Once accepted, the installation only takes a few seconds to complete - the installation is completely invisible to the user once the install is accepted. The Stealth Edition installer is able to be emailed to your remote PC's - where the remote user of your computer can download and run the installer to immediately install SpyAgent and start monitoring. Once the install is complete SpyAgent will be monitoring in stealth mode automatically. You still, however, have to access the PC physically to view the activity logs SpyAgent records. The Stealth Edition installer installs and executes the SpyAgent software in complete stealth. All you have to do is run the installer once, and SpyAgent will be monitoring your PC in total stealth! SpyAgent's logging capabilities are unmatched. SpyAgent can log anything from what the user types, to the files they printed and programs they ran - all time stamped by date for easy viewing. All logs are easily saved and exported for later use. SpyAgent has a large array of security and stealth features. SpyAgent is undetectable under all Windows versions (it does not even show up in the task manager on any Windows 32-bit platform) and can circumvent popular third-party "spyware" detectors. SpyAgent has powerful lockdown and logging scheduling features, log file encryption, optional startup warnings, and much more. SpyAgent Stealth will not appear in the Windows task manager - the user will not know anything out of the ordinary is running! SpyAgent Stealth will not appear in the Add/Remove Programs Control Panel. The user has no direct method of uninstalling the SpyAgent Stealth software. SpyAgent Stealth will not be visible in the Start Menu, Desktop, or System Tray. The user will have no idea anything has been installed! SpyAgent Stealth will detect and eliminate spyware detector software before it has a chance to interfere with SpyAgent's operation. SpyAgent Stealth is configured to load on Windows startup (invisibly) for all users - it will even log non-administrator guest and limited accounts without additional configuration.